The Union Street Residence Center includes innovative classrooms for the Bloomington campus, including a Café Classroom that seats 49 students and a Learn Lab that seats 56 students. Details of the two classroom spaces may be found below. The Learn Lab offers enhanced opportunities for collaborative learning approaches as well as project-based classes. 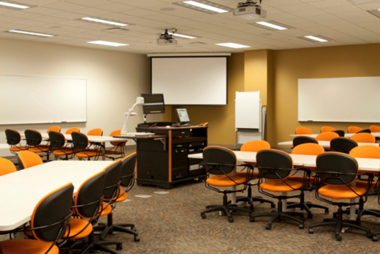 The room has been configured to take account of the ways in which instructors and students move between lecture mode, discussion, and collaboration. Three projection screens assure an easy view of materials from anywhere in the room, and 8-person tables and extensive whiteboards allow students to work effectively within and among groups. This layout breaks down the traditional classroom hierarchy and enables the instructor to move freely across the room, engaging and interacting with all students. This unique classroom is particularly suited for project-based classes, team-based learning, or other pedagogies that rely heavily on student interaction and collaboration. In addition to the three projection screens, the Learn Lab has Huddleboards (portable whiteboards) for team use and a Copycam (whiteboard camera), as well as an interactive whiteboard that enables the capture of instructional materials produced in the classroom by both the professor and the students. Additionally, the Learn Lab is equipped with a PC, Macintosh, laptop connection, document camera, and DVD/VCR/Blueray. 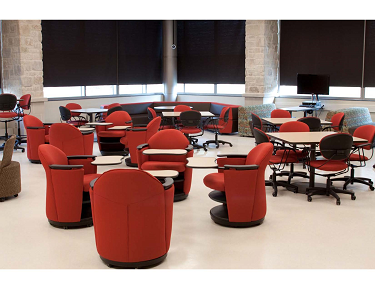 The Café Classroom challenges traditional assumptions about classroom design to create a learning environment that utilizes informal seating to emphasize interaction and student-centered learning. The layout and furnishings break down the traditional classroom hierarchy and enable the instructor to move freely across the room, engaging and interacting with all students. Soft furnishings, high and low bistro-style tables, a corner sofa, and booths equipped with monitors and PCs facilitate collaborative learning and group work. Five other seats along the wall provide additional computers to support group work as needed. The Café Classroom makes use of the most current technologies, including projection to the screen and to the booths, a Copycam (whiteboard camera), as well as an interactive whiteboard that enables the capture of instructional materials produced in the classroom by both the professor and the students. Two whiteboards and additional Huddleboards (portable white boards) support group work. Additionally, the Café Classroom is equipped with a PC, Macintosh, laptop connection, document camera, and DVD/VCR/Blueray. Applications will be accepted from all IU Bloomington faculty—tenured, tenure-track, and non-tenure-track. Associate Instructors may apply with the support of an appropriate faculty member in their area. This call for applications is co-sponsored by the Office of the Vice Provost for Undergraduate Education, Office of the Vice Provost for Faculty and Academic Affairs, Residentail Services (RPS), Space Management, and University Information Technology Services (UITS).